John P. Olsen, New Age Music World host and contributing author for NewAgeMusic.nu has interviewed composing New Age artist Paul Sills from the United Kingdom. The Interview discussion is focused on Paul Sills early music career, and his 2 outstanding albums, Astral Doorways & Walking Across Heaven. 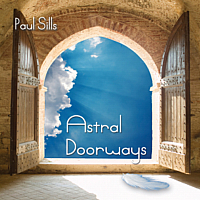 Astral Doorways was Paul Sills first release that explored the divine and surreal side of music. His first and second release are symbolic of the outer confines in synthesized ambient music that simply become a natural choice for those who love a memorable journey into the outer reaches of electronic resonances and a deeper realm in relaxing music. Walking Across Heaven is his release that is crafted like a beautiful sound sanctuary where instrumentals of piano, flute, acoustic guitar, and distant choral vocals rose to transform each song into one having an anthem like quality. Today we present this interview to find out more about Paul Sills, and his unique brand of celestial music. John P. Olsen: I have enjoyed getting to know you after first introducing yourself to me awhile back and found your music history quite interesting. Could you tell our readers about the earliest beginnings in your music career? Paul Sills: Thanks John! My family, on both sides, are musical so I was brought up surrounded by people who performed in bands and wrote their own music. My Dad always had a guitar lying around and later purchased a piano and a keyboard. I used to tinker around at an early age, not knowing what chords were but knowing if they sounded nice or not. I took acoustic guitar lessons in the first year of high school but they didn’t last long. I think I preferred to find my own way rather than under instruction. If my teacher knew that I now had two albums released he would fall off his chair! 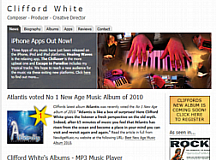 In my teens I wrote music with a friend of mine, Michael Poole, and we recorded some tracks. I was designated vocalist! In my early 20’s I moved to Singapore to live with my Dad. He had a whole set-up with a 4-track tape recorder. Over those years in Singapore I wrote and recorded, probably, close to a thousand ‘vocal’ ‘rock’ songs. Listening to them now they are very noisy and I would hate for anyone to hear them! Even though I was recording loud and furious, I always felt there was something in there that was atmospheric. Later, I bought myself a Yamaha PSR keyboard which was great for home recording. I joined an ‘expat’ band called Haze where I played guitar. We were noisy but it was fun. I still preferred the solitude of writing and recording. It was around this time that I heard Medwyn Goodall’s Clan album. Things took a drastic turn for me as I discovered I had finally found the kind of music I wanted to write. I had previously listened to some of the New Age CDs by Nightingale Records but it was Clan that really took me into the genre. Its still a fantastic album and provides much inspiration to me. John: Since you were performing in a Rock band, what led you to leave the group and become a New Age music artist? Paul Sills: We weren’t a serious band, it was more something to do on a Saturday afternoon. We were all friends in a foreign land and just got lucky that we had a bassist, drummer and someone who could almost play a guitar! Writing and recording alone is where my passion lies. I can lose hours ‘in the zone’. 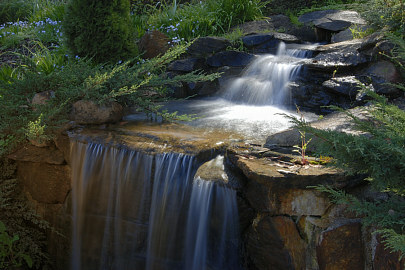 New Age provides a fantastic outlet to express your creativity in so many different styles. It opens all kinds of doors, you aren’t restricted by the genre and there is always something new to explore. John: What was the specific turning point that finalized your decision to compose your first album Astral Doorways? Paul Sills: I originally sent Medwyn Goodall (MG Music) a demo in 2004. I did get a reply that was both encouraging and helpful. It wasn’t until my second demo in 2006 (with special thanks to Catherine Young and Peter King, from the MG website forum, who encouraged me to do so) that I was offered the opportunity to record an album for the label. The idea for Astral Doorways didn’t come until I had already written an albums worth of material. 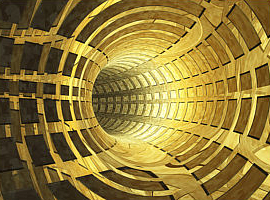 This material was shelved and I started again, basing the new material on the tracks Cloud Dancing and Astral Doorways. I found I enjoyed the ethereal landscapes with simple but effective melodies. Once I had this idea in my head I went for it with a passion. John: After your working relationship and friendship with Medwyn Goodall first began, how did you become recognized as a member of the MG Music family? Paul Sills: Its an honor to be in personal contact with Medwyn. To be a fan of someone’s music initially and then to have both a professional and personal relationship is amazing. He is a really nice guy who is both extremely honest about your music and encouraging. He never flatly says ‘no’ to something unless he knows it has no chance of working. He will nurture and guide you all the way. I was initially a member of the MG Music forum and got to know like minded people, both musicians and listeners. I already felt part of that family before I even told anyone I wrote music. To then release albums with the label was a real joy. Everyone was encouraging. 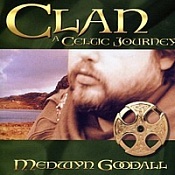 John: Naturally, I have heard Clan : Celtic Journey by Medwyn Goodall, and I agree it’s a great album too. So having drawn inspiration from his albums, and also having played in a Rock band, it makes me wonder how the individual Paul Sills style of composing and performing music developed. Was it always present, or did you have to discover your own distinct brand of celestial music? Paul Sills: Influences come from every kind of music for me. I like all kinds, not just New Age. I’m a massive U2 fan, so those earlier albums like The Unforgettable Fire, played a big part. Their partnership with Brian Eno brought them into something else and that transition was when I really latched onto them. Those Eno soundscapes were the initial influence on my music and where I wanted to go with it. Clan : Celtic Journey showed me melody and rhythm (although I have yet to write any drum related albums) working together to produce drama and passion. The followup, The Scroll, has the most beautiful piece of music ever written – A Maiden’s Kiss. Now, that is probably the biggest influence on me, so far as emotion in music is concerned. Being influenced by so many different kinds of music has to have some unique effect on what you write yourself. However, when I sit down to write and record, all those influences consciously go out of the window. My head is empty of anyone else’s music and its just me and a blank canvas. Many artists will probably cringe when I say this, but the writing and recording process are done at the same time. I will come up with a simple chord sequence first but after that its all done in the moment. Sometimes it takes hours of building with the final melody rearing its head very late. Sometimes I get lucky and the track will present itself very early. I wrote six albums worth of instrumental material from 2004-06 so I’ve had a good amount of demos to draw from. John: How would you describe the music of Paul Sills to another person? Paul Sills: That’s a tough question. It would probably be easier for someone who listens to it to answer that. I would probably say its very atmospheric, mystical and dreamy, with simple melodies that you can latch onto and actually hum. I aim to write emotional music but at the same time something that can take you away somewhere else. John: If you don’t mind discussing the creative side to your music, when you produced the celestial music of Astral Doorways & Walking Across Heaven, do your creative abilities just occur naturally, or do you have to really work at making everything come together while composing? Paul Sills: Well, I write spontaneously most of the time and things happen naturally. This is sometimes a blessing because you are travelling the journey as a listener, not knowing where its going until you get there! It’s also dangerous because the destination may not be the nirvana you hoped for. Writing in this manner allows me to be more creative. If I was to follow a strict brief I would probably end up writing a ‘New Age Painting By Numbers’ album. I doubt it would sound as fluid. Some people work best this way, I know, but I work better when I almost let the music show me the way! We do tend to fight a lot but the music always wins! ha ha! Saying that, I’m getting more structured these days and plan a little more. For the next album I have planned it like a story, each song being a chapter. I know what approach I need for each track. Each page of my ‘book of chords’ has one word written at the top in bold capitals. This one word is my brief for that track. John: One question your fans and I want to know is will we see another Paul Sills album soon, or in the future perhaps? Paul Sills: I’m a quarter of the way through the next one and the tracks, so far, have been well received by MG. Its not been an easy year up until now. I wrote and recorded a whole album and had to shelve it. That was where the spontaneous approach didn’t work out. Although tough, it was the right decision. I came out of it with a fighting spirit and knew what I had to do. I settled on a stronger theme and am really enjoying it again. John: I admire both of your albums equally and honestly would not have been able to tell which one was your first, if I hadn’t known. Do you feel the same about both albums, or do you have a clear favorite, and could you give us insight into some of your songs during their production? Paul Sills: Thanks John! Its difficult to choose a favorite as I like each for different reasons. From a production point of view I would say Walking Across Heaven. There is more atmosphere on that album and its more structured with regard to its theme. I learned a lot recording Astral Doorways and applied those lessons to Walking Across Heaven. Astral Doorways has its own uniqueness that I love. Walking Across Heaven has a little more drama, whereas Astral Doorways is very pure and innocent. I do, however, think they go hand in hand and I see them as a pair. The one track on Astral Doorways that really set me on my path is Angelic Radiance. Once I had recorded that I knew what my sound was and where I was going to take it. That track was originally written back in 1996 in Singapore. The chord sequence and melody just seemed to hit the spot. I used the same chord sequence and melody in the track Angelic Grace where the piano takes more of a leading role. Another favorite track of mine is the opening to Walking Across Heaven, Towards Enlightenment. I think I wrote and recorded that in a couple of days. Its one of those tracks that just fall in your lap and when its finished you think ‘how did that happen?’ Compare that to Footsteps in the Clouds, that took two months to complete, and you are never sure how long a track is going to take and sometimes you never quite know when its truly finished! John: Is there anything you would like to add or tell our readers that I didn’t bring up in our Interview today? 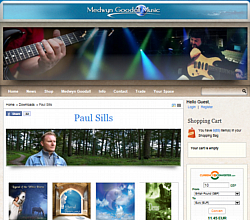 Paul Sills: I would just like to invite all New Age listeners to check out the Medwyn Goodall Music forum. If you like to chat to people who like this kind of music then make your way there and enjoy. 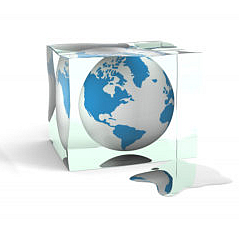 The people are very friendly and the topics of conversation vary. You can also get the opportunity to talk to Medwyn Goodall and can ask him anything about his music. All the other artists are also very approachable. John: Here at our sites we have been playing songs from your albums on our 365 Stars Radio, and they are doing well in ratings, which comes as no surprise to us. I became a fan of your music from the very beginning. B.T. Fasmer and I both Thank You for your time Paul and wish you and everyone at MG Music the best. Paul Sills: Thank you for your kind words John. All the best to you both… and cheers! Sample or purchase albums and songs by Paul Sills at Amazon.com. Photos courtesy medwyngoodall.net. Paul Sills latest album Walking Across Heaven, released by Medwyn Goodall Music in 2008, is a beautiful experience which is more like a transformation or angelic journey at times than one would expect from even a great New Age album. Quite a unique and wonderful surprise to this author. The Walking Across Heaven album title perfectly describes what to expect for those listeners who prefer their New Age music with a medium tempo, yet powerful theme. 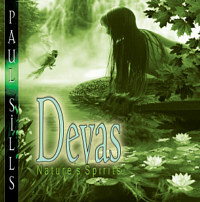 Those new to Paul Sills will welcome this wonderful creation that is deep, flowing, full of emotion and very spiritual in nature. Persons who already own the previous 2007 release Astral Doorways know the intensity of Paul Sill’s music and will definitely want to include his current release, if they haven’t already made the investment. Paul Sills album containing 8 songs is consistently powerful throughout, offering a synthesized atmosphere in which piano, flute, acoustic guitar, and distant choral vocals rise to transform each song into an anthem with hymn like quality. My noteworthy song favorites are: Track 2 Footsteps in the Clouds, which begins with a piano sequence upon combining orchestral movements, glide into a heavenly anthem. Track 6 Walking Towards Heaven, has a graceful melody which will raise your spirits throughout the entire song. Track 7 Hall of Voices, is full of distant choral harmony in which one can almost imagine being lifted upward by angels into the final heavenly destination. 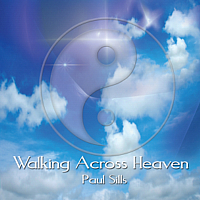 Paul Sills Walking Across Heaven album containing 8 songs is consistently powerful throughout, offering a synthesized atmosphere in which piano, flute, acoustic guitar, and distant choral vocals rise to transform each song into an anthem with hymn like quality. The Walking Across Heaven album cover is appropriate in describing what awaits the listener, having a deep blue cloud filled background and the bold Taijitu symbol or widely recognized in modern times as the Yin & Yang symbol. The ancient symbolic character Taijitu was introduced in China during the Ming Period around (430 A. D.) by author Lai Zhide and has remained a constant in being adopted worldwide by many different cultures and philosophies throughout the centuries. When translated, Taijitu can be defined as The diagram of the supreme ultimate power. This accurately describes the latest contribution by Paul Sills and I thank him for the latest creation, having enjoyed the experience. Walking Across Heaven is a collector’s edition for those seeking a celestial journey in electronic music while still residing here on this Earth, but don’t bother packing friends since luggage will not be a requirement. Sample or purchase music by Paul Sills at Amazon.com.